When you think about “Serverless Printing” you probably don’t think about Secure Printing. It kind of seems counterintuitive, right? Having your print job securely held so that you don’t have to run across the office to grab it off the printer before anyone else sees it, without a server to hold the job? Well, now you can do that. PrinterLogic provides serverless printing and secure printing. You get client-based secure printing, with each print job held on the end user's workstation instead of being stored in a central server that acts as a single point of failure. It’s secure, direct-IP printing. The same applies to Pull Printing (or Follow-Me Printing by another name). Jobs are held on the user’s workstation until they are released for printing. Now to release these jobs you’ve probably heard of using ID badges, active directory credentials, or PIN codes. 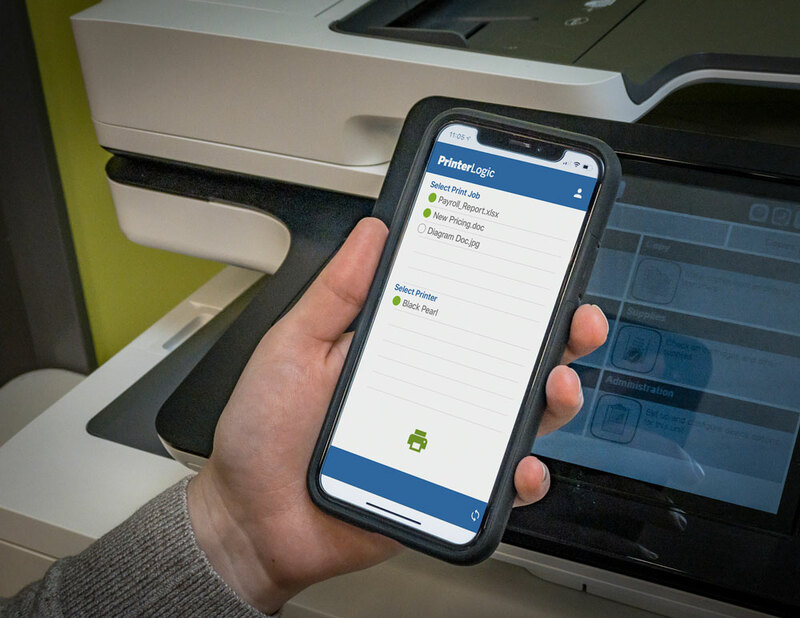 You have those options using PrinterLogic, but now we’re also very excited to offer the new PrinterLogic Print Release App for smartphones. Without any extra hardware or infrastructure of any kind, you are able to download the app, iOS or Android, log in, and see all your jobs being held for you. Viola! Users can select multiple jobs to release at once. Have printers from multiple manufacturers at every site you manage? No problem. The app is manufacturer agnostic. Don’t have the budget for badge readers for every printer? No problem. Download the app and hit release from your phone when you’re at the printer ready to retrieve your job. This isn’t an entirely new concept for PrinterLogic. We have a mobile web-release portal that lets you use a phone and go to a URL to see your print jobs, and then release them. But what we found is that customers aren't really using it because it's not as easy as using an app. You had to bookmark the URL where print jobs are found and then sign in every time. Because it was a miniature browser page viewed on your phone screen, the type was small. It just wasn’t very convenient. But it gave us a start. When we created the app we leveraged that back-end functionality and built on it. Our goal was to make it simple, while also not requiring someone to sign in again and again. With the Print Release App, you can set it and forget it. It looks clean and is intuitive to use. We made it so users can save their PrinterInstaller or PrinterCloud URL and their AD credentials locally. No documentation is required. A user can launch the app and use it right off the bat. Getting and using the app is very straightforward. Just go to the App Store or Play Store and search for PrinterLogic. Download the app, sign in to the PrinterLogic URL, and use your regular credentials. No special login needed—just whatever you use to sign in to your computer. This most easily works with PrinterCloud, our SaaS-based solution, because a user just needs an internet connection to release their print job. With PrinterInstaller, our on-premises solution, the user’s phone would need to be on the same network as the PrinterInstaller server or on a trusted network with access to the PrinterInstaller server. Reach out to a PrinterLogic rep at any time to set up a meeting. Or check out the resources on our website. You can try out the new PrinterLogic Print Release app and provide true no-print-server secure printing to your organization! Ethan is a commercial systems engineer at PrinterLogic. He assists account managers in helping potential customers learn about the PrinterLogic solution through online demonstrations and facilitating trials of the software. One of the things he enjoys most about his work is helping customers optimize their print-management capabilities and experience. Prior to his two years at PrinterLogic, Ethan held various positions in IT and customer service roles. He holds a Bachelor’s Degree in Business Administration and Information Technology.